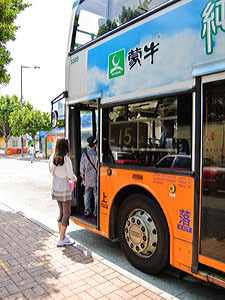 Probably one of the most popular ways to get to Victoria Peak, other than the Peak Tram of course, is via CityBus Bus route 15. 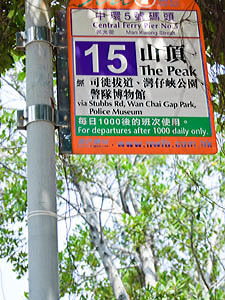 Not 15C which is also considered part of the route to The Peak, but takes you only to the lower Peak Tram terminus, but Bus 15 which takes you all the way to The Peak itself. 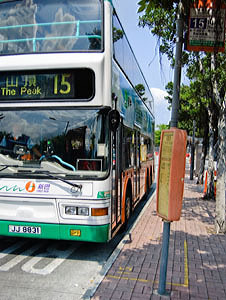 If you choose to use Bus 15 to go to The Peak it will take at least 40 minutes, possibly an hour if there are road works or traffic jams, so it is quite a slow way to go. On the other hand it is an interesting route with lots to see and of course being a simple public bus it is extremely cheap, just HK$9.80 per person and half price for children. The Bus 15 starts at the public ferry piers in central which is a mildly inconvenient place to get to, unless of course you happen to have just gotten off a ferry! The first stop is outside ferry pier 5 which takes ferries for Cheung Chau, and the next stop is outside the world famous Star Ferry pier which goes to Tsimshatsui in Kowloon. Piers 4, to Lamma Island, and 6, for Lantau, are also just a few moments walk away. The next stop on the bus is the very centrally located Exchange Square bus station which is at ground level below the Exchange Square office towers which house the Hong Kong Stock Exchange. 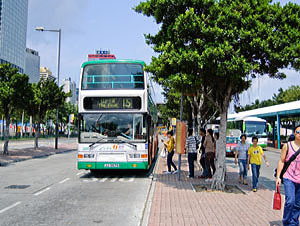 If you are not starting at the ferry pier then catching Bus 15 to The Peak at Exchange Square is probably the best. You can reach Exchange square easily via taxi or MTR from anywhere in Hong Kong. The bus takes quite a long route through several interesting districts of Hong Kong and allow you in a short while to see multiple sights. First the Bus 15 goes through the Central business district where you can see the big towers of the Stock Exchange and the large banks. Then it goes eastward first through Admiralty where the big Pacific Place Mall is located and through smaller mixed residential and commercial streets and Wanchai where it passes the public wet market building. Turning uphill into more residential areas passes the Adventist Hospital and Bradbury School on Stubbs Road. Which are both wealthy residential areas. Going then up into the Mid-Levels there is a short detour into the dead end of Guildford Road and then Mansfield Road where it stops going in and and also going out. Back onto the main Peak Road it follows the very winding and typical Hong Kong hillside road with its many twists and turns with sudden fall offs overlooking the south side of Hong Kong island far below. This is in fact a great part to get off the bus and walk a few stops to enjoy the view and take some great pictures of Hong Kong from a vantage that is rarely used. Another Bus 15 will be along soon and you can resume your trip, though of course after paying another fare. See Also Bus 15A from Shau Kei Wan and Bus 15B from Tin Hau MTR station.